In medium bowl, beat butter with electric mixer on medium speed until fluffy. Add cheese and sour cream; beat until blended. On low speed, beat in flour and Italian seasoning just until blended. Cover; refrigerate 30 minutes. Heat oven to 350°F. Spray cookie sheets with cooking spray. Place dough on lightly floured surface; knead 3 or 4 times. Divide dough in half. Roll each half into 12x6-inch rectangle. Cut crosswise into 6x1/2-inch strips. In small bowl, beat egg yolk and water; brush over dough. Twist strips and place on cookie sheets. Sprinkle with sesame seed. 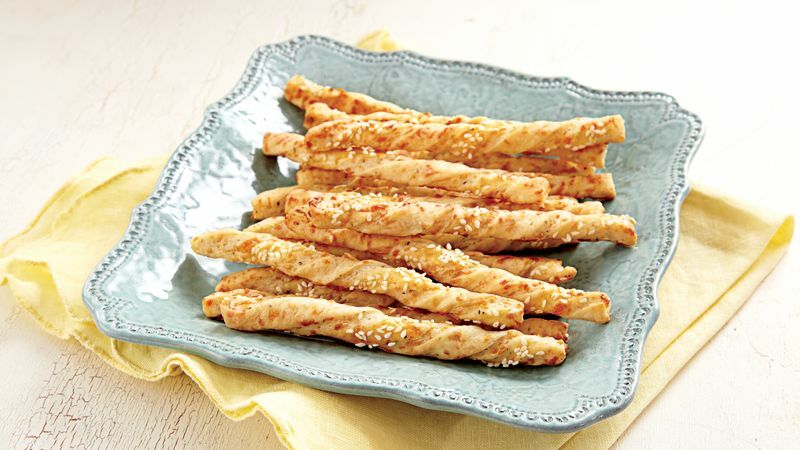 To Freeze: Place cooled baked breadsticks in resealable freezer plastic bags; freeze up to 6 months. Thaw at room temperature. To reheat, place on cookie sheet. Bake at 350°F for 5 minutes.